Home » » Jock & Lee go out with a WIN! Jock & Lee go out with a WIN! 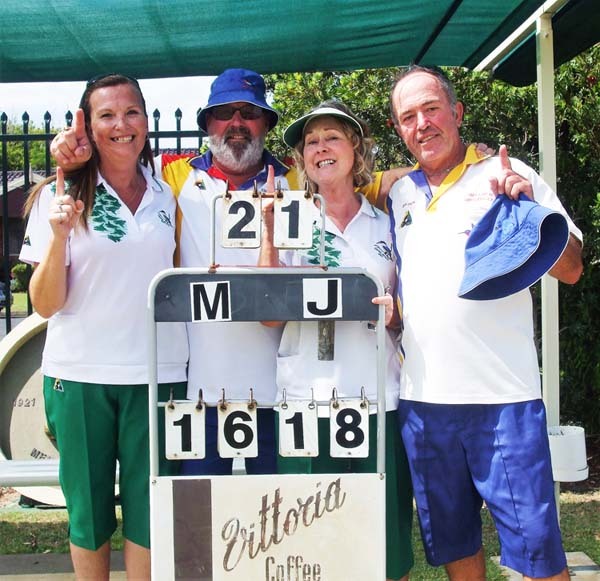 The final of the mixed fours proved to be one of the highlights of the year with the game going down to the wire on the last end. “Jock” Young’s team of Lee Morley, Corinne Dixon, Jeff Dixon beating the experienced team of Elaine Finlayson, Leanne Chenoweth, Shane Starkey and Mal Dodd’s 18-16 on the last end. The game had the spectators on the edge of their seats for the game. Well done. Unfortunately Jock and Lee are leaving for greener pastures around Grafton and we wish them well in their new adventure.